With Pandora MP45-DR Mini PC, you can enjoy sharp quality videos and crystal clear sound. The all new mini MP45-DR will provide you with the best experience and the most compact system in the world for its outstanding performance. The MP45-DR is not just the smallest PC in the world: It took advantage of the Mobile on Desktop (MoDT) technology that helps miniPCs to adapt to the latest hardware such as Intel Core 2 Duo processors and GM45 chipsets. Their low power consumption makes them very suitable for home entertainment and office purposes. MP45-DR comes with built-in IR Receiver and Remote Control which let you find your entertainment content more easily. The Intel® Core™2 Duo desktop processor delivers revolutionary dual-core performance and breakthrough processor energy efficiency. Microsoft Windows Vista™ offer a whole new way to manage your precious memories, your music and your life, all with an enhanced sense of security. The Pandora mini MP45-DR adapts the Intel GM45 and ICH9M chipset to support Core 2 Duo (Penryn) and Celeron CPU with 800/1066 MHz FSB and up to 4GB Dual Channel DDRII 667/800 MHz memory. You can enjoy high definition videos and fast performance with it. The mini MP45-DR equips the next-generation Intel Graphics Media Accelerator X4500MHD, including built-in support for full 1080p high-definition video playback. For gaming, the MP45-DR delivers optimized 3D graphics performance and support for Microsoft DirectX 10, Shader Model 4.0 and OpenGL 2.0. Meanwhile, MP45-DR supports 5.1ch surround sound output via a Realtek ALC888 chipset. These graphics and sound enhancements ensure the performance and compatibility you need for HD content and gaming. For best multimedia support and enjoyment, MP45-DR equips a Super Multi optical drive and a Microsoft Windows Vista MCE wireless remote controller. For dual display function, a DVI to DVI + VGA Y Cable and a DVI to HDMI adapter are provided. You can connect one display via DVI or HDMI and another display via VGA to establish a dual display environment. On the rear panel of the MP45-DR there are many I/O ports. They are Line-In/Out Jack, Microphone Jack, USB 2.0, DVI, e-SATA, RJ45 LAN ports and one Kensington Lock Hole corresponding to your different needs. On the front panel, MP45-DR has a Power Button and two USB 2.0 Ports. The mini MP45-DR has an option for built-in 802.11b/g/n wireless, Bluetooth, analog/digital TV modules, and slim type Super Multi or Combo optical drive to fulfill different requirements. MP45-DR will only cause 27db in operation with AOpen’s special designed thermal solution. 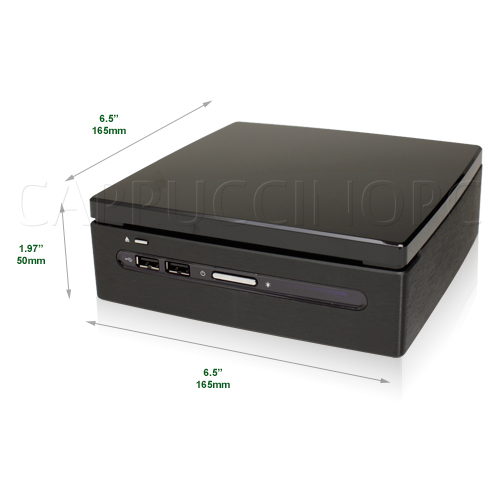 And its size 165(W) x 50(H) x 165(D) mm makes it the smallest desktop PC system (1.3L volume) in the world. 6.5" x 1.97" x 6.5"